Someone said that reading the daily newspaper is our modern form of morning prayer. Here you see the frontpage of a German daily, the FAZ, January 5th. 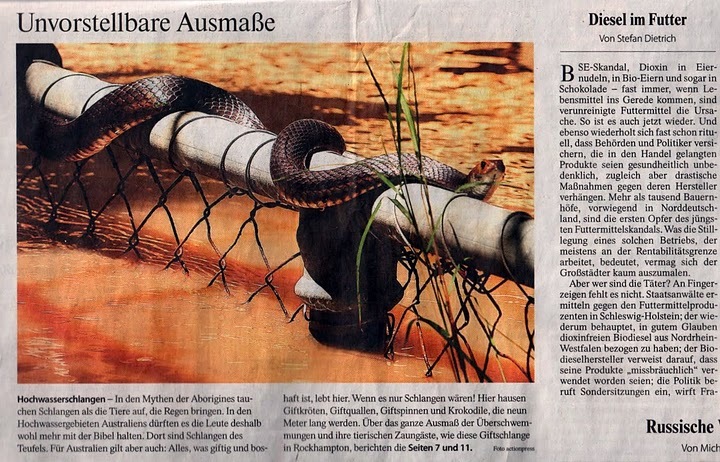 Under the heading "Unimaginable dimensions", it displays a photo of a poisonous snake seeking shelter from high water in Rockhampton, Australia. The caption says that according to the myths of the Aborigines, snakes are animals that bring rain. But the majority in Australia are Christians who believe in the bible, and there the snakes are the devil's messengers. Quoting (ironically?) a proverb, the caption goes on saying that everything poisonous and evil lives in Australia, before it gives a hint to the articles inside the newspaper about the flooding in Rockhampton. Last summer's heatwave in Russia brought July temperatures that were well above any previous readings. The Pakistan floods followed rain of an intensity never recorded before there. The same applies in Australia currently. Yes, of course its La Niña that's the direct cause. But the alternation between El Niño and La Niña is cyclical, happening every three to seven years, so it doesn't explain why the recent precipitation has set a 100-year record. While the Queensland flood inquiry will focus on hydrology and the dam's management, there will be deeper issues here of decision making under uncertainty and ignorance, and how such decisions should be made in the future. Thus, my morning prayer started with the photo of a poisonous snake seeking shelter on a fence in flooded Rockhampton, and after crossing different worlds of mythical, religious and scientific thinking, it ended with local or regional dam management in this area. "knowledge, interest, justice and power (...), heaven and earth, the global stage and the local scene, the human and the nonhuman" (ibid, 3). "cut it with a well-honed sword (...): on the left, they have put knowledge of things; on the right, power and human politics" (ibid). (today no egg for breakfast, please). I do not think that precipitation records in Australia are good enough over 100 years to say that. Anyway, the recent flood In Brisbane has not set a 100-year record, and the 19th floodings were more severe. It seems that he may be re-interpreting the historical record in his own way. It is also unfortunate that climate models cannot agree on the question of whether climate change will bring more stronger or more frequent El Niño or La Niña events. If the causal link is speculative, wouldn't it better to not mention it ? Especially the last claim, that science should represent those without voice seems to describe a classical function of politics. If this role is taken by someone from science, it can only be individual scientific advocates (Latour's spokespersons). Maybe you started meditating a bit too soon? this is a never ending discussion. Stefan Rahmstorf answers your question with yes, it is better to mention it. Period. In the context of my story, climate change has its place, no doubt. The question is there, that's enough. There is the flood, and there are snakes, the devil, the Aborigines, the Christians, and there is climate change, too. None of these elements and their characteristics are indisputable. The Christians might doubt the version of the Aborigines, for sure; biologists might doubt that snakes are evil, and maybe the Pope denies that Australia is devil's home (not sure). Endless discussions. And who is responsible for the dam? More discussions that are brought forth by this extreme weather event and are linked to it. And in faraway Germany, Stefan and Eduardo discuss the Australian flood and its relation to climate change. Climate change is a new guest at this Brisbane debating club; we will see if it will be relevant or not, in the future. Whenever 'future' is - time and space are also under permanent debate (Aborigines insist in spatial terms in songlines instead of geographical maps, and time is for them a different category, too). Glad you like my post! Yes, I tried several endings and was never quite sure how to get out of this long story. Anyway, to answer your questions: I have to admit, "to improve the storylines" is a strange expression. I just wanted to say that science is able to narrate or to present complex events in a very exact way. Scientists are great storytellers, and it is important to have their stories with all the details involved. The good thing about natural scientists is that they are so exact, that the transition from one step to the next in their story is logical, and that they are so close to the real (sometimes). "to add complexity": I just want to say that each of those supernatural, natural and human actors in this story deserve their own experts, as does each of the discussions involved. Who is to decide that the Aborigine version is of no importance? Go ask the anthropologist and he will tell you a different story! Same with the theologian, the biologist, the climatologist, and of course all those social sciences, and don't forget the engineers! Complexity means that they all should have their saying when we talk about global warming and its effects. But I agree, reiner, to find an end to the story was difficult. Maybe my story means something entirely different. The floor is open for better endings or conclusions! there is seldom a free lunch for anything. A few years ago some people also asserted that global warming would cause more hurricanes. A few papers were published a few years ago demonstrating a statistical link between global temperature and number of hurricanes. Now, climate models later turned to simulate less hurricanes in the future ( although more of the highest category). Since we have had a global lull in the last few years, much less vocal claims have been made about hurricanes and climate change, but it remains in the blogosphere as one of the unjustified claims of 'climate researchers'. It might be that at that time -as now- those scientist were completely honest in their believes, as Hans wrote here before , but they should admit that such claims entail large risks of credibility for all, and not just for them, namely when they turn out not to be correct a few years later. In the case of Australian floods this development is becoming obvious again: global waring causes droughts (when it does not rain) and floods when it does rain. Great post, Werner, espacially N° 4. Please tell us more about the Aborigine's concept of time. I think the late Stephen Schneider provides an example of how science can interact with decision making in an age of uncertainty: as everyone knows he was suffering from cancer, but he played an active role in his own treatment. He wanted to have all information from his doctor, certainties and uncertainties, odds and probabilities, and in the end he wanted to decide by himself. He also did not blindly accept that information but checked it out by himself.